----Source: Clark County Press, Neillsville, WI, February 6, 2008, Front Page, Transcribed by Dolores (Mohr) Kenyon. After 46 years and four generations of customers, Merlyn Kroll, owner of Mabie’s Barbershop, retired Monday. But it will be a casual retirement, Kroll said, since he plans to still cut hair Mondays. And the shop itself will live on, in the capable hands of Neillsville native George Miedziak who opened Head Quarters this week. Miedziak, a barber for 35 years, recently moved back from Grafton. 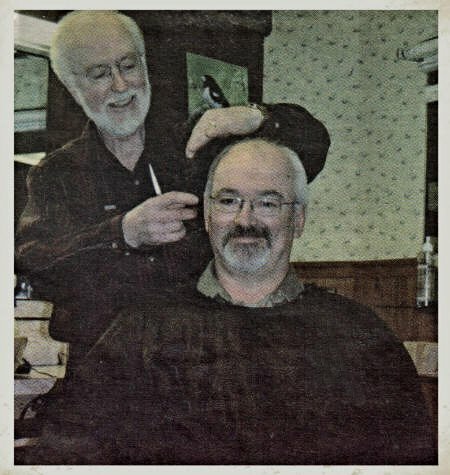 Longtime Neillsville barber, Merlyn Kroll, gave George Miedziak a trim early this week. Miedziak, who will take over the former Mabie’s Barber Shop re-naming it Head Quarters, has returned to Neillsville after owning a shop in Grafton. Kroll is retiring after 46 years as a barber. The shop’s history goes back to 1936 when a young barber named Milo Mabie came to town and opened a shop on 7th Street next to the present day Green Lantern. Mabie had served a lengthy apprenticeship with a Granton barber. Back then, there was no formal schooling for barbers, Kroll said. In 1939, he moved to the southeast corner of Hewett and Fifth Street. Mabie served in the Navy from 1942 to 1946, and when he returned, Harold Fisher (*Pischer) sold him a shop next to what is now the Cozy Kitchen for "a nominal fee." Fisher’s one condition was that he receive free haircuts the rest of his life and that they not last longer than five minutes. Mabie was usually the one to give Fisher a haircut since Kroll was, at that point a novice barber. "As an apprentice, I didn’t feel comfortable with that," Kroll said, laughing. The stories of Mabie and Kroll merged when Kroll married Mabie’s daughter, Jean. The idea of becoming a barber didn’t hit Kroll until after high school in the early 1960’s, he said. And at the time he had no aspirations to join his father-in-law’s shop. "I went to school with no idea I’d be offered a job. He never asked me and I never suggested it." Kroll left Neillsville briefly to attend barber school in Milwaukee in 1961. After working in a Milwaukee shop, he came back to Neillsville in 1962 after Mabie offered him a job. "There’s something about a small town; they support you in your joy and sorrow. I have not regretted it for one day," Kroll said. In 1962, Mabie was still in the shop on Hewett Street next to the Cozy Kitchen. Haircuts cost men either $1 or $1.25. And barbers were expected to shave customers with a straight razor, if they requested it. Many did, Kroll said, with some coming twice a week for a shave. He wasn’t comfortable at first with shaving, Kroll said, but he remembered how customers were always willing to give him a chance to practice. For many it ws sign of trust and acceptance to let the new barber shave them. "They wanted to make me feel welcome," Kroll said. Friday nights, in particular, were busy then, with families coming to town to shop, visit and get haircuts. "The streets were really busting in those days," Kroll said. Friday often found him working as late as 10:30 p.m. to finish customers’ haircuts. One change he has noticed, Kroll said was people put less emphasis on getting a haircut for special occasions. Men’s hairstyles have come really full-circle since the early 1960s, Kroll said. Back then, one of the most popular styles was a "flat-top." "I did as many as seven flat tops in a row," Kroll said of the early 1960s. But soon long hair was in vogue, thanks to the Beatles. When discussing hairstyles, Kroll said, "There’s really nothing new. I’m right back where I started," he noted. "Instead of an oil-based product, people use gel. Anything goes now." The sixties saw another change at Mabie’s - scheduled appointments. Men used to come in and simply wait for their turn in the chair, but with several barbers working in Mabie’s shop, appointments became a necessity. But it wasn’t welcomed at first, Kroll said, with many men asking, "Who do you think you are, doctors?" And the customers at Mabie’s shop were not always men. Many women in the 1940s and 1950s came to Mabie to get a haircut in the days before women’s hair salons and franchised shops. Kroll said that he still has a few women customers.  Some memorable customers from the early days included local philanthropist Kurt Listeman; Dr. Milton Rosekrans, who came for a relaxing shave; and four generations of the Wuethrich family; beginning with family patriarch John D. Wuethrich. The early 1970s saw some changes at the shop with Kroll and Mabie moving across the street to the shop’s current location. In February 1972 the shop opened in what had been a men’s clothing store and shoe store. Herb Rhodes, who owned the Clark County Agency, bought the building, remodeled it, and later sold it to Kroll in the late 1970s. Mabie continued to cut hair, later working part time until he died in 1985. In 1986, Kroll divided the lower floor and leased space to Natalie Hauge, who still operated a beauty shop there. At one time Neillsville had as many as seven barbers. By the 1980s that number was down to two, Kroll said. In the surrounding towns smaller than Neillsville, barbershops began to disappear when the owners retired or died. And that changed his customer base, he said, recalling that it was not uncommon to have customers from Rock Dam, Loyal, Marshfield, Hatfield and Greenwood all on the same day. Since the mid-1960s Kroll has operated a sideline business installing TV antennas and later, satellite dishes. In recent years he has taken Wednesdays off. When he considered the possibility of retiring, Kroll said he could not completely leave the business. "The realization came to me that this has been an important part of my life. I would miss coming down here," he said. Kroll said his business philosophy came from a former instructor who told him, "You may not always give the cut they wanted, but you sure can give them the impression you tried." "I always respected that concept," Kroll said. I am writing in response to an article in your paper from February 6. I was born and grew up in Neillsville and in the story about Merlyn Kroll retiring it is mentioned that Milo Mabie was sold a shop by Harold Fischer that is an error, it was sold by Harold Pischer, with a P. His daughter Helen lives here in Milwaukee and I recently talked to her and she said that her dad Harold and Mabie had a companionship.